Flowering vine plants are so romantic that I think at least one should be in every garden. There is nothing like walking under an arbor through flowering plants draped up above, seeing them on a trellis, or adorning a pergola. Fragrant vines add even more, but even if they are not, it is a lovely experience. There a numerous vines that can be used. Some vines don't flower, but why would you choose one of those?! Clematis vine is another one of the beautiful perennial flowering vines. There are many varieties that come in different heights, colors and flower sizes. Clematis likes the sun, and its roots like to be cool. Plant some low perennials or groundcover at the base of these plants. 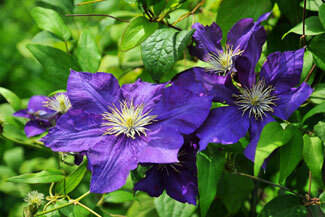 One of my favorite Clematis is 'Jackmani', which is a dark purple/blue color. It's very showy! 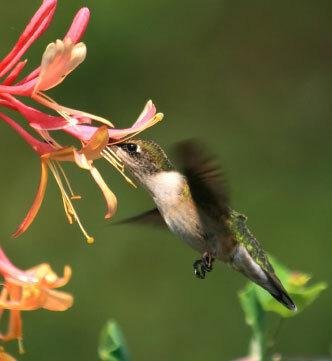 If you remove the flowers as they finish, it will prolong the period of bloom. 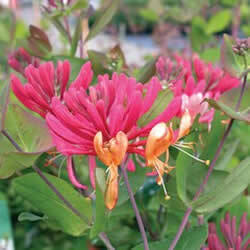 This is a true perennial and will die down in the beginning of winter. This flowering vine is a woody, deciduous plant that produces beautiful pink flowers with subtle gold centers. It does best in at least 4 hours of sun per day at a minimum. It is one of the fairly fast growing vines. Normally it blooms on and off throughout the season. Native Honeysuckle can be quite invasive, but these flowering vine plants are not at all. I blooms for a decent period of time. However, even when not in bloom, it is a lovely plant with pretty leaves. Trim it back a bit once a year to encourage growth from the bottom. Also, you may have to guide along the arbor in the beginning. It should start wrapping itself, but you can always tie it in a few spots to help it alone. I absolutely love Morning Glory vines! They have some pretty happy faces! most of them are blue so if you are partial to blue flowers, you will love this plant. It starts blooming in the summer and goes right through to mid to late fall. 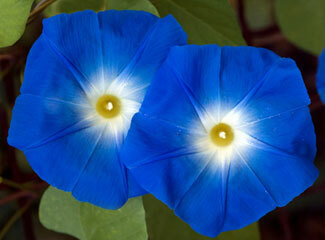 Morning Glory vine is an annual and grows quickly...one of the VERY fast growing vines!. You will have to re-plant it each year. 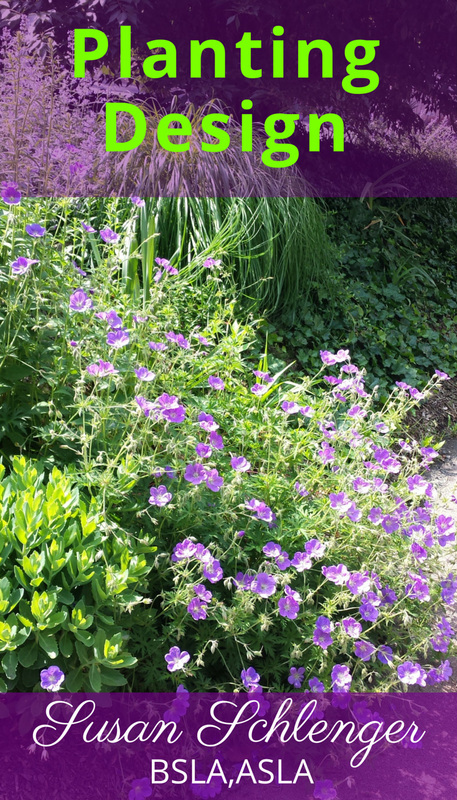 However it re-seeds easily so look for new little plants in the spring. Do NOT fertilize it. I made the mistake of doing this once and had hardly any flowers. Roses are well know for climbing over arbors with their beautiful and fragrant flowers. I am not one for roses that are high maintenance, so here are two that you will find easy to take care of. Another nice rose to use is 'New Dawn'. This is paler pink in coloring and is also fragrant. It flowers almost continuously throughout the season. 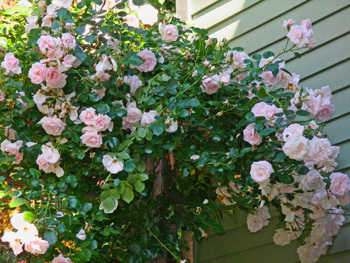 This rose will cover your arbor with greenery and flowers. Looking down on it from and upper window is quite a picture. 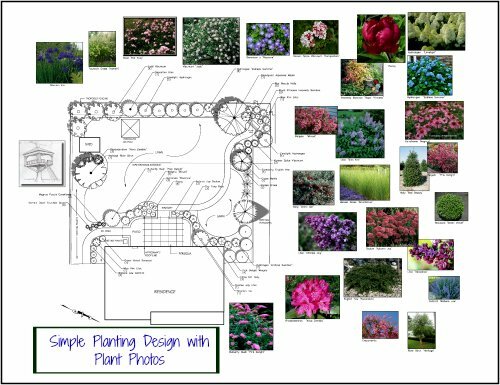 It will also be a very showy part of your garden. This flowering vine plant is lovely. The flowers are white and not as showy as typical Hydrangea flowers. Yet it has other great features. The leaves of Climbing Hydrangea are a pretty, glossy, dark green and slightly rounded. these flowering vine plants will adhere to what they are climbing on by itself, so there is no need for tying the branches or stems. In the winter, it does lose its leaves, but the color of the remaining stems is a pretty rust/brown color and therefore provides winter interest. Design and consultation services for NJ residents.